Thinking about getting inked? Check the bottle first. But people getting tattoos can get infections in the skin even in the cleanest conditions. 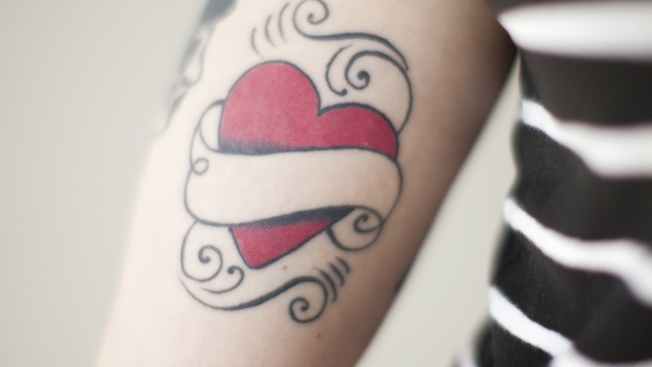 The ink can carry bacteria that can spread through the bloodstream — a process known as sepsis. Symptoms are fever, shaking chills and sweats, and the risk is particularly high for anyone with pre-existing heart or circulatory conditions. Less severe infections may involve bumps on the skin, discharge, redness, swelling, blisters or excessive pain at the site. And you may not be out of the woods for a while: The FDA says it has received reports of bad reactions to tattoo inks right after tattooing as well as years later. Some of the recalled bottles have a multicolored Chinese dragon image with black-and-white lettering, while some are missing manufacturer information. In general, the FDA says those looking to get a tattoo should always ensure that the ink has a brand name and a location of the business that manufactured it. Three years ago, 19 people in Rochester, New York, ended up with bubbly rashes on their new tattoos, linked to contaminated water that was used to dilute the ink. Permanent tattoos aren't the only tattoos that carry risk. An FDA alert earlier this year warned that temporary tattoos popular with kids and often found at beaches, boardwalks and other holiday destinations can be dangerous. The main risk is from black henna, an ink that is combined with natural red henna and can include chemicals that can cause dangerous skin reactions. "Depending on where you are, it's possible no one is checking to make sure the artist is following safe practices or even knows what may be harmful to consumers," the alert read.